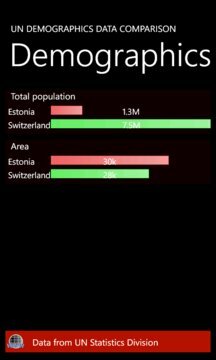 Personal Phone Intelligence (PPI) for Estonia is an app that uses different visualisations to show data about Estonia, compares it with the country you are located in, and offers a quick access to many activities and web resources. The app was built as a demonstration of how mobile device can be used to augment everyone by offering them easy access to intelligence relating to everyone interested in Estonia. The app uses publicly available data sources and Azure Marketplace data sources to provide data for graphing. The app updates its datasources' configuration periodically making sure that the latest visual cues about events in Estonia will be displayed. The app notes flag days, holydays, e-voting days (note e-voting site requires a phone with Mobile-Id for actual voting via phone), voting days, etc. In addition, the tiles and links reveal different pivots and references to outside materials, that can be useful for citizens, tourists or just geography enthusiasts.